Everest panorama trek is a short trek with the wonderful views of the Mt.Everest, Lotse, Ama Dablam and many other snow peaks. We trek until Syanboche where we get the Syanboche airport, the highest airport in the world. From Syanboche we can observe the beautiful views of Khumjung and Khunde village. Khumjung (3,780m) is the largest village in Khumbu that presents you wonderful mountain views. The original Hillary school, established by Sir Edmund Hillary in 1961, is in the middle of Khumjung. There is a impressive Gompa in Khumjung village from where we can view Ama Dablam, the rocky pyramid of Thamserku and crags of Khumbila. The Khunde village (3,840m) is famous for Khunde Chamkang, a Buddhist temple. Inside the temple is a statue of thousand-armed Avalokitesvara, the Tibetan god of compassion, who is represented on earth by Dalai Lama. The popular Namche Bazzar, the capital city of the Sherpas, is also a main attraction of this trek. The 'Saturday Market' at the bottom of Namche is interesting for tourists to get a chance to socialize and shopping. Day 01: Arrival at the Kathmandu international airport. You will be picked up by our office representative and transfer to the hotel. Day 02: A 35-minute flight from Kathmandu to Lukla (2,700m). Take breakfast in the nice restaurant with beautiful views of surrounding mountains. Then a five-hour trek to Monjo (2600m) starts from Lukla. The trail is almost flat and little up and down. On the way, you will see complex of ‘mani walls’ and ‘chortens’ and brightly painted ‘prayer wheels’. Overnight stay at the hotel in Monjo located at the bank of Dudh Koshi River. Day 03: You will enjoy your breakfast with wonderful surrounding greenery. At 7am, our trekking starts to Namche Bazaar (3450m). 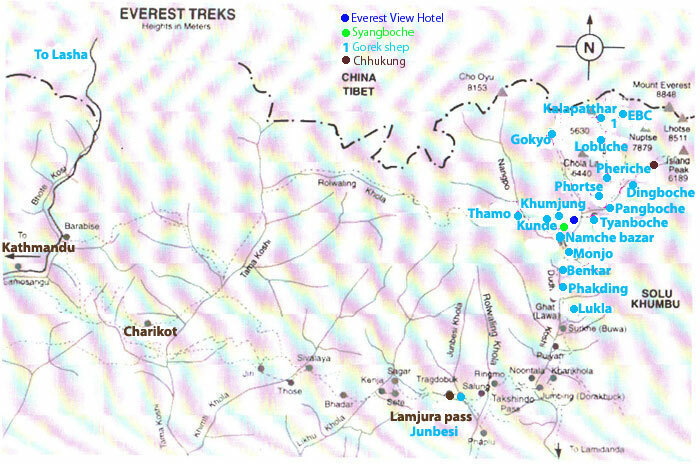 We walk about a one-hour through flat trail and three hours uphill trail to Namche Bazaar. Day 04: After breakfast, five hours trek to Phortse.Phortse is the village of the Sherpa settlements. There are 80 houses with one beautiful Monastry. Some time people could see snow leapord. Day 05: After breakfast, trek back to Khumjung. Khumjung is the beautiful Sherpa village with Kunde monastery. Where tourists could view the scalp of Yeti. Keep walking continue till lukla. All together it will take 8 hours to lukla. Day 06: Fly back to Kathmandu and farewell dinner with Nepali cultural program.